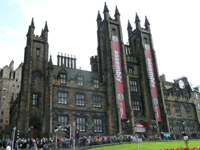 A very busy month with us finding ourselves up in Scotland enjoying our fourth visit to the Edinburgh Fringe Festival. It also gave us an opportunity to meet up with our friends Tony & Jude. Needless to say we had a great time. We celebrated several friends birthdays - Nick's Six Zero and Alison's Five Zero which were very enjoyable. Our house building project continues a roller coaster of emotions - is it on or not? Jane always parks her Smart Car in the garage but one morning she came out to find it in the middle of the yard. She realised that she hadn't left the handbrake on but how did it roll out of the garage? we suspect one of the cats attempted to jump onto the roof and in so doing gave it sufficient push to overcome it's inertia. 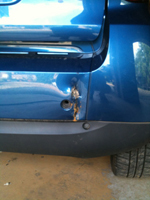 Initially she thought no damage had been done but someone at work pointed out the dented bumper. On closed inspection it was clear that it had rolled back into the house and then bounced forward to rest in the middle of the yard. She quickly got three quotes ranging from £600 at the Mercedes garage to just over £100 at Elite Motors Body Shop. No prizes for who she went to. For the fourth time in ten years we travelled up to Edinburgh for the Fringe Festival. We have always had a great time and each time we book again we think it cannot be as good as the previous visit. Once again the city and the festival surpassed our expectations. We planned ahead by becoming a "Friend of the Fringe" that gave us early notice of some of the more popular acts and we booked them on-line months in advance. We also took a netbook with us so that we could book on-line from our rented flat just off Grassmarket. To complete our booking technology armoury we also booked on-line between shows using our iPhones. Over the six days we managed to see nineteen shows and absorbed the atmosphere around the street entertainers despite the persistent rain. 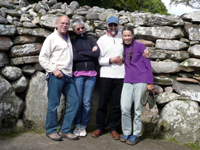 We spent a few busy days with Tony & Jude, enjoying their hospitality, their lovely garden and its produce, and we also saw some of the beautiful countryside and beaches along the Moray Firth – Forres, Elgin and Findhorn. 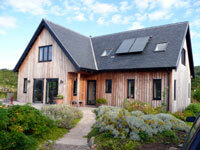 Their house is one we would like to model our own self-build on. It is very open, warm and welcoming. It is also has low energy consumption using photovoltaic cells and solar panels. 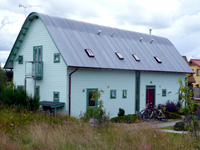 The houses in the Findhorn Community are particularly fascinating as there are a variety of designs, all aimed at being carbon neutral. 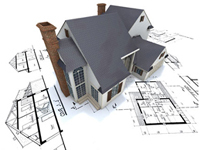 This is a great place to get ideas about house design, what works and what might not. There doesn't seem to have been many restrictions placed upon them from the local planning authority which adds to the fascination. All of the residents are committed to an ecological life style and despite Steve referring to them as hippies on more than one occasion he secretly admires their ambition for a tranquil lifestyle, at one with the environment. He also forgets that in his youth he had a Lambretta painted pink with flowers all over it and hair down to his shoulders - hippy or what? 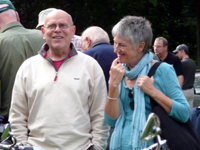 We visited a classic car and motorbike show at Brodie Castle where Tony & Jude were particularly fascinated by some of the bikes. We were more interested in the cars that we had either owned or wished we’d owned over the past forty years. Of course there were many that we wouldn’t wish to have at any cost but we did see an old Austin Healey 3000 similar to one we nearly bought back in the 1970s. It was a good nostalgia trip and the sun shone all afternoon. A tiger moth flew over the castle to announce the end of the event - brilliant. We walked from just outside Forres into the town itself along some wonderful, wooded tracks with peaty burns running through them. 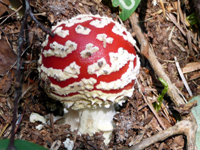 We saw some fungi that I don’t think we’ve ever seen before – Fly Agaric. Jane as always had a camera to hand. This is a beautiful landscape helped by sunny weather and good company. If it wasn't for the ties we have to Northamptonshire we would certainly consider moving up there. With our short stay coming to a close very quickly we just found time to visit some stone circles that were about 4,000 years old. Tony & Jude come here on the shortest day and if the sun is shining the sun's rays at sunset are in line with the entrance to the stone circles. It just so happened we were there at a time when our shadows followed the entrance into the circles – spooky. Nick found a plot of land at the beginning of the month in the village of Sywell. The village isn't the most attractive because it is really one long road that links Overstone to Sywell and is classic ribbon development (or that's what it was called when we did O Level geography). The plot itself is really good consisting of one acre with many mature trees and a small area designated as woodland. The price at auction is likely to be quite high and therefore it's unlikely we will be able to afford it. Dave & Lucie are not happy with the location so are not going to engage with the purchase. Towards the end of the month we heard that the plot is likely to sell for £460,000 and therefore it is well beyond our budget however we will still go along to the auction in early September just in case the developers don't turn up.